One of the better "X-Men" films in the franchise. Directed by Bryan Singer, 'Days Of Future Past' is the last film of the original X-Men series. 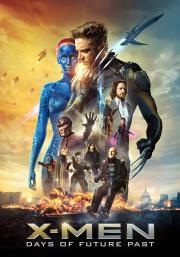 Inspired by the 1981 "Uncanny X-Men" storyline, this movie is an entertaining comic book installment with a good story. Wolverine travels back to 1973 to prevent doom to both humans and mutants. The movie is fun and exciting super hero thrills. This film is very well cast with good performances by Jackman, McAvoy, Fassbender and Lawrence.